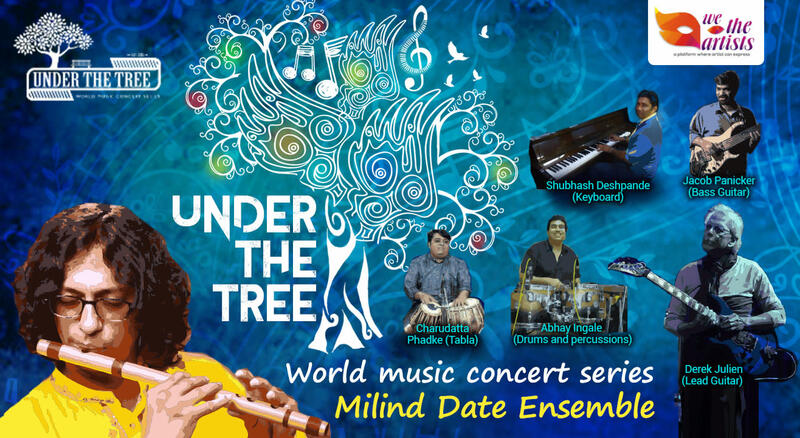 Under the Tree, India's First (Fusion) live in concert series is a unique fusion music concert that actually takes place under the tree. Season 1 of under the tree saw 5 concerts featuring 50 artists from across the country. Season 2 concert 1 is scheduled on 20th Oct featuring an Emmy award nominated artist. Here is a unique series which provides a stage for exceptional young and renowned musicians & artists to come together and showcase new flair & format of music to grip musical heart beats together. Milind Date is one of the finest bansuri players in the world. He is critically acclaimed for his immaculate bansuri – bamboo flute playing and composing. Milind is one of the senior-most disciples of world famous bansuri virtuoso – Pandit Hariprasad Chaurasia. With more than 3000 performances to his credit, Milind has vast experience of performing on various stages and for varied size of audience ranging from 20-30 to 30,000/50,000! His concerts are energy packed and the crowd involvement is surely exciting! Milind is an Emmy and GiMA awards nominated artist. Derek started professionally at the age of 17, playing all over India, with a popular and one of the earliest bands in its day, the Mystiks. Derek has been a professional guitarist since 1967. He has performed music genres such as rock, jazz, blues, fusion and pop. Playing in Africa & Europe, in 1971, Derek became part of the legendary progressive rock band ‘Waterfront.’ This undoubtedly is the experience, on every possible count. "In 1973, we headed out to Europe. That's another great story, one that demands a book all to itself," says Derek.